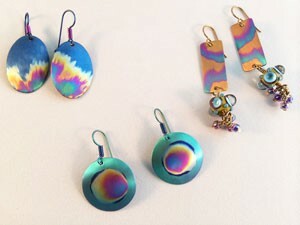 Anodic Painting is a unique way of applying color to niobium. You will cut, file and sand niobium sheet to prepare for anodizing. Bath anodizing is used to give your pieces a solid background. Then with special paintbrushes you will paint abstract designs on those shapes. This class is an introduction to anodic painting intended to familiarize you with using the paintbrushes.